Portsmouth NH is at the northern end of New Hampshire's seacoast, right across the river from Kittery, Maine. Interstate 95 passes right through Portsmouth NH on its way between the Boston area and Portland ME (map). The Spaulding Turnpike (NH Route 16) goes north from Portsmouth toward (but not quite to) Lake Winnipesaukee. C & J Bus Lines connect Portsmouth NH with Boston MA and its Logan Airport. Amtrak's daily Downeaster trains stop at Exeter NH (12 miles/19 km SW) and Durham NH (12 miles/19 km NW), but not in Portsmouth itself. The airports at Manchester NH, Boston MA and Portland ME are equidistant from Portsmouth, but Boston's Logan Airport has the most national and international flights. 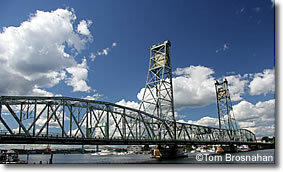 Bridge from Portsmouth NH to Kittery ME.